Here you'll find all of our handcrafted skin products including our all natural Beeswax Skin Creams, the World famous So Ho Mish Miracle Cream and our pain relieving Bee Venom Ointment! To view all of our Natural Skin Creams, simply scroll down. Do you find yourself with excessively dry, cracked and painful skin every year when the temperatures drop? Or does your eczema or psoriasis flare up as soon as the weather gets cold? Our customers tried dozens of creams and lotions in their search for relief before finding the Winter Wonder Cream (aka the Natural Beeswax Body Cream). Expensive steroid based prescriptions, the latest and greatest brands pushed by Hollywood stars and the best creams they could find at the pharmacy - none of them worked. Fortunately, bees create a substance so effective at healing skin problems that hospitals are now using it to help heal burns and sores caused by chemotherapy. We spent years experimenting, testing and refining our beeswax 'potion' until we got it just right in the form of an all natural cream, free of any parabens, fragrances, or preservatives. "P.S. I bought your skin cream (unscented) for my little girl because she has such dry skin. That cream is like a miracle - I have never found a product that works so well on her. Thanks." 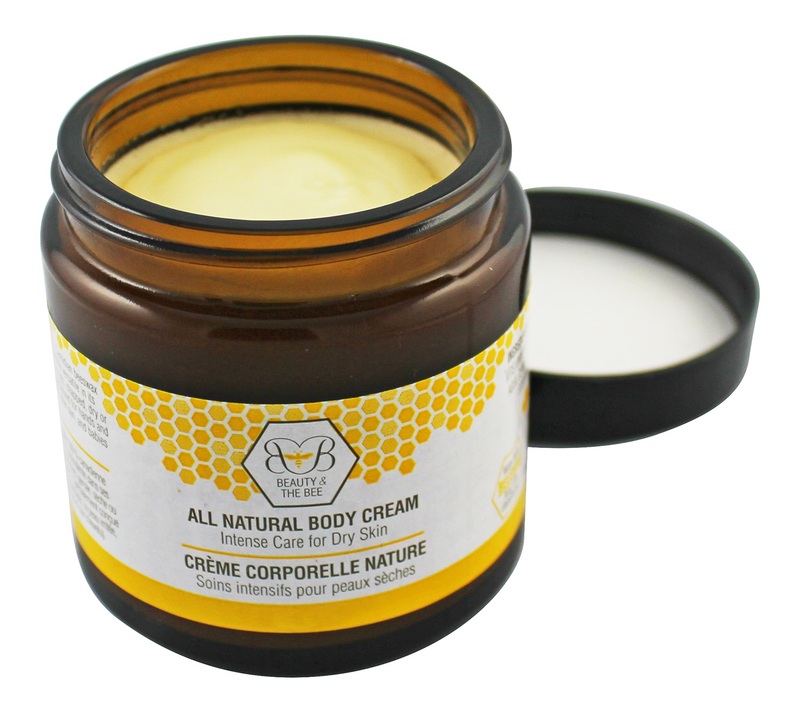 "By the way, my husband has been using the beeswax cream on his psorasis & it's amazing. He's been trying all different creams, etc. from the Doctor and this by far has been the most effective ever!!!!!" "My 4 year old grand daughter had really dry hands and rash all over them and up her arms like ezcema- I believe it was from using the hand sanitizer at school. She was always scratching because it was so itchy for the poor little girl. She stayed with us over the Christmas holidays and I used the Lavender Skin Cream on her several times a day and really applied it generously at night. In about 4 or 5 days, her rash was pretty much all gone. I sent the cream home with my daughter who continued to apply it to her. My granddaughter even started asking for it after a couple of days. My favorite part was not only that it worked so well at clearing up the dryness and rash, but that it is all natural." Highly effective for Psoriasis, Eczema and Cold Sores. Nature’s Salve by Beauty and the Bee is a soft healing cream that can be applied to give relief to skin irritations. 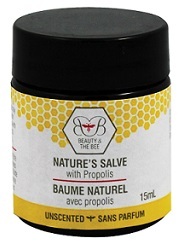 Our salve repairs the skin with bee propolis while the beeswax protects against outside moisture and bacteria. Read how Propolis is helping treat painful skin conditions here. Honey bee venom contains at least 18 active substances. Melittin, the most prevalent substance, is one of the most potent anti-inflammatory agents known (100 times more potent than hydrocortisol). Apis Venenum, Methyl Nicotinate, Oleum Sinapis Volatile, Oleum Terebinthinae, Piper Nigrum oil, purified water, sodium chloride, methylparaben, propylparaben, water soluble base, fragrance. Beauty and the Bee's Honey Kissed Lip Butter is a creamy beeswax lip care product sweetened with Dutchman's Gold Wildflower Honey. When you dip into Honey Kissed, it will leave your lips sweet, soft and glossy. Containing only four all natural ingredients that will moisturize, soften and sweeten your lips. This little wonder will do the trick in a pinch, so keep it handy. Use it on your on lips as well as dry cracked cuticles & knuckles. The Vitamin C & Manuka Honey Gel Cleanser by NOW provides a deep, gentle cleanse while working to brighten skin tone and smooth texture. Extra Virgin Olive Oil, Aloe Vera, and natural Vitamin E are included to enhance the brightening properties and drawing moisture to the skin without clogging pores. Uses: Combination or dry skin with minor color imbalances, dull appearance, uneven tone, light scarring or imperfections caused by acne or other blemishes. Skin in need of deep, gentle cleansing. Suggested Use: After moistening your face with water, apply a liberal amount of cleanser to the face and neck region. Gently massage in for 1-2 minutes, rinse clean and pat dry. For best results use daily in the morning and at night. Ingredients: De-ionized Water, Aloe Vera (Aloe barbadensis) Leaf Gel*, Lauryl Glucoside, Sodium Coco-Sulfate, Vegetable Glycerin, Carrageenan, Glucose/Glucose Oxidase/Lactoperoxidase (natural preservative), Magnesium Ascorbyl Phosphate (Vitamin C), Manuka Honey, Allantoin, d-Panthenol, Niacinamide (Niacin), d-alpha Tocpherol (Vitamin E), Extra Virgin Olive Oil, Orange-Grapefruit Aroma and Citric Acid. 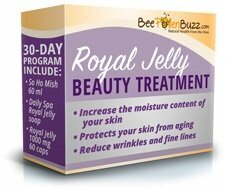 This hand crafted royal jelly soap is 100% pure. 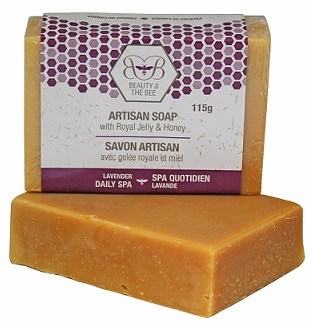 It contains absolutely nothing artificial and is carefully crafted by hand in small batches using the raw honey and beeswax direct from the Dutchman's Gold hives. Wash your face daily with the Daily Spa soap and then apply our famous So Ho Mish skin cream for absolutely radiant skin. Naturally saponfied oils of Coconut, Palm, Olive and Sunflower, beeswax from the Dutchman's Gold hives, Canadian honey, Grapefruit Seed Extract, Royal Jelly & Lavendar Essential Oil.